This six part BBC drama is about the life and tumultuous reign of Elizabeth I, including her rise to the throne, quest for a suitor and the challenges she faces with the threat of the Spanish Armada. Starring in the lead role of Queen Elizabeth is Glenda Jackson (Sunday Bloody Sunday, Women in Love) supported by Ronald Hines (Young Winston, Not in Front of the Children) , Stephen Murray (The Nun’s Story, The Magnet), Rachel Kempson (Out of Africa, Tom Jones) , Robert Hardy (Sense and Sensibility, Little Dorrit) and John Shrapnel (Gladiator, Troy). The series won five Emmy Awards, including Drama Series, New Series, Achievement in Costume Design and Glenda Jackson scooped the Continued Performance by an Actress in a Leading Role prize, as well as Outstanding Single Performance for the episode “The Shadow In The Sun”. scenes in episode one and two. Nearby Chiddingstone village also features in the first two episodes of the series, for the scenes where Queen Elizabeth celebrates her rise to the throne. St. Mary the Virgin Church in Chiddingstone features in episode two for the scene where Lord Robert Dudley waits at the church for Queen Elizabeth. Penshurst Place is set in 2,500 acres and boasts limestone exteriors as well as the 14th century house with medieval interiors, beautiful gardens and parkland. 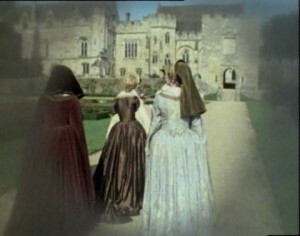 Penshurst Place is a popular film location, having been used for productions such as The Hollow Crown – Henry V (2012), The Other Boleyn Girl (2008) and The Princess Bride (1987). Chiddingstone is a one-street Tudor village with its properties boasting half-timbered sides, gables and stone-hung red-tiled roofs. The village is owned by the National Trust to ensure its preservation and has previously been used for productions such as Walking Through History (2013) and A Room With A View (1986). Nearby Chiddingstone Castle has featured in Bargain Hunt (2012). Elizabeth R also features in the Kent Film Office Tudor(ish) Trail which celebrates Kent’s Tudor history and film connections. 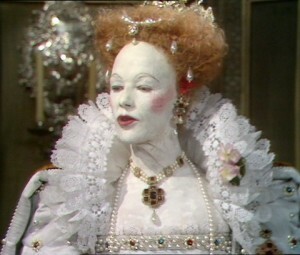 Elizabeth R was shown on BBC in 1971 and is now available to buy on DVD. This entry was posted in Filmed in Kent and tagged Elizabeth R film locations, TV Drama. Bookmark the permalink.